The subject of BNP Paribas' internal environment will be divided into two parts, namely their organizational culture—core values, consistency of behaviour, socialization rites, subculture and symbolism—and knowledge management—indicative of how BNP Paribas handles the process of innovation and learning within the organization. A large determinant of an organization's dominant culture is sourced by its founders and top decision makers. Since the Group's 2006 merger with BNL BC, and their 2009 merger with BGL and Fortis, their workforce essentially doubled. The bigger picture now had BNP Paribas employing upwards of 185,000 workers from 170 different nationalities, operating in 75 countries worldwide. These four core values are the base for the Group's dominant corporate culture. It is interesting to note, that when BNP's leaders formulated these 4 principles, they firmly did not wish their new organizational culture to be awash with rigid rules and procedures that would mentally fatigue both employees and managers, but rather chartered them with the intent to inspire managers in their day to day behavior of managing employees. The management principles mirror a vision, a conviction, a motivation and a manner of existence for BNP Paribas, and it is thus crucial that their managers endeavor to promote them. Diversity governance is a 'language' if you will, that exemplifies what BNP Paribas values as an organization. Considering the organisation's new size and cultural diversity of employees the Group identified discrimination in any form as one of its 30 key operational risks. Furthermore the Group's leaders were convinced that it was essential to endorse a diversity policy supported by its managers globally. BNP Paribas CEO, Jean Laurent Bonaffe agreed, saying: "…diversity within our ranks leads to increased creativity and is a driver of performance. Diversity is everyone's business." BNP Paribas' diversity policy is backed by their Diversity Committee, which is comprised of 26 diversity officers. This committee leads overall organizational policy formation together with senior management and Human Resource teams, and are already actively involved in shaping BNP's internal organization into a progressively diverse organization. Additionally, the diversity committee emphasizes gender equality, and has legislated internal policies, such as their diversity training programme, to make its management culture more international and gender balanced. Since the Group's commitment to diversity, their internal global people survey shows 84% of BNP Paribas employees have a positive perception of the organisation's commitment to diversity. This data suggests that the firm is coping well with its new organizational size and is actively integrating diversity into its corporate culture. BNP Paribas' cultural values are encapsulated in their signature and logo: the emblem of four stars taking flight, and progressively rising and growing. To BNP this boldly symbolizes dynamism and progress. BNP Paribas values their employees greatly and allocates annual budgets to cover individual needs but also organizational rites such as social functions, family benefits and leisure activities. Below is a chart that reflects some of BNP Paribas 2012 budgetary allocations towards activities used as a means of transmitting culture, reinforcing the importance of its people and its goals. These socialisations are particularly important to new recruits, who have yet to absorb the BNP Paribas organizational culture. Prior to BNP's merger with Paribas in 2000, their organizational culture was predominantly French. Their more traditional management ethos was implicit, and knowledge was personal, specific to an older management context, and difficult to formalize. Nonaka & Takeuchi (1995) suggested that shifting knowledge from implicit to explicit is vested at the core of meaningful knowledge management. Thus BNP Paribas' subsequent growth in size necessitated a planned change in knowledge management, from less implicit to more explicit, or codifiable and easily transmitted knowledge and from information processing to knowledge creation. Managers were thus mandated to promote and reflect the Group's commitment to implementing the necessary changes of organizational learning and innovation. The key challenge of this lay in convincing these officers and managers that these new principles and values must be the basis of BNP Paribas' continued evolution and success. Management instituted four values to make the Group's knowledge management effort a collective success. Responsiveness—improved assessment speed of new developments and risk identification. Creativity—encouraging employees' new ideas, initiatives and contributions to collective knowledge of the organization. Commitment—fresh outlook on model treatment and service of clients. And lastly ambition—fostering aspirations for leadership among employees and departmental teams; desire for team success. In an attempt to facilitate the creation and harnessing of new knowledge and fostering a work environment of innovation and learning, BNP Paribas initiated the annual Innovation Awards. Top management would accept 1000 applications from teams with the most innovative solutions to client-specific problems and who created the most value for them. The top 10 most operationalized innovations that have taken a tangible form and that can be expressed to the top management in a comprehensible way, are the winners. The award ceremony held at Place de l'Opéra branch in Paris, is a big event on the company calendar and is one of BNP's annual rituals expressing their cultural commitment to organizational innovation. 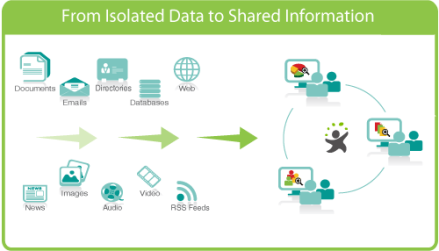 Introducing an appropriate structure: Removal of barriers to communication and information sharing. The creation of chief knowledge officer or other boundary-spanning positions is vital for many organisations to overcome blocks to the flow of information up and down BNP Paribas' organizational structure. Benoit Minvielle was introduced as one of BNP Paribas Knowledge Managers and competitive intelligence officer in their Brussels branch. He alone would be responsible to identify corporate knowledge and the barriers preventing its collection and utilization. His position involves encouraging personal and group learning and sharing, as well as harnessing trapped knowledge into understandable work processes that can become new additions to the book of knowledge of the organization. Making appropriate use of technology: Mostly IT based, data sharing, electronic data collection, conferencing, data mining, secure software storage, etc. The IT industry growth in recent years means that all organisations that make use of computer software will generate considerable amounts of data. This data must be securely held and made available when necessary at minimal effort and costs. However, not all raw data is meaningful and open to interpretation. To deal with this problem, a prominent BNP Paribas branch in Cardiff hired the software services of PolySpot Enterprise Search (PES) for their comprehensible software application, K2 that offered full overviews of converted data into meaningful information accessed from multiple sources and stored securely within the firm. This collection of data into useful packages that could be easily interpreted reflected BNP's process of turning data into knowledge. The information discussed above, lends support to the idea that BNP Paribas is most keenly linked to the managerial school of organizational learning. Argyris & Schon (1974) call this 'deutero-learning' or a process where the aspects of single and double-loop leaning merge. Essentially managers help form atmospheres of increased learning capacity. Within the BNP Paribas Group, spatially dispersed divisions are seen to possess a supportive 'office' culture, team focus, collective goals, low power distances and free flowing information. Known for being an otherwise highly responsible bank, the gargantuan $8.83 billion dollar fine slapped on BNP Paribas in mid-2014, for dealing with nations subject to US sanctions, seemed disproportionate. The fine came at a poignant time in the global financial services industry, for three reasons. 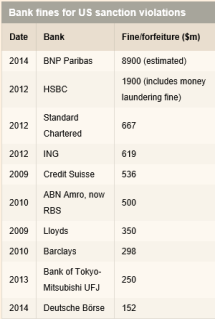 First, BNP Paribas fraudulent activities were found to be deliberately repeated in patters over many years. Second, this year (2014) American financial authorities faced substantial criticism for their lenience with big banks, both during and post 2008 financial crisis. Finally, the US' determination to turn financial services into a more effective foreign-policy instrument may have affected the robustness of the penalty. Although the fine decreased BNP's share price by 15%, July 2014 had BNP Paribas shares rise 3.4%[v] after announcing it would pay dividends of €1.50 per share – this came as a wonder to those assuming the 2014 dividend would have been canceled out by the colossal fine! In a conference with investors that month, CEO Jean-Laurent Bonnafe insisted that the $8.83 billion penalty had not destabilized the resolve of the Group to continue providing exemplary financial services. Additionally the French Bank tightened all its internal controls to take a firm stance against fraudulent activities and corruption, and had taken the necessary steps to dismiss 13 of its top corporates. How has this damaged the Group's reputation and what may be the outcome? A stipulation of the fine stated that BNP would be banned from converting clients' foreign currency payments into US dollars, in some of its key divisions. This ban may prompt clients to seek a fuller financial services provider elsewhere. Perhaps BNP may deal with this gloomy prospect by asking other banks to perform these US currency clearing functions on its behalf. BNP is particularly concerned that its clients and environmental constituencies do not view the Group as having assisted Sudanese President Omar Al Bashir, by conducting oil trading transactions with the nation, as he has been indicted by the The Hague for war crimes. These shocking developments present an opportunity for BNP's people to step up and initiate change to regain consumer trust. With many prominent figures fired, subcultures will have to prove their responsibility in order to gain employee empowerment. The firm should include rules of transparency and anti-corruption within the mandates of its new choice of top management, and preserve pride in its organisation and services. New management should consider delegation of tasks a primacy in the new organizational structure. The stronger the organisation 'family' culture, the better a position BNP will be in to weather the consequences of the recent dark days. [i] Barnwell, I., & Robbins, S. 2006. Managing organizational culture. In S. Goodall & F. Eden (Eds. ), Organisational theory: concepts and cases, 5th ed: p431. Frenchs Forest, NSW: Pearson Education Australia. [iii] Barnwell, I., & Robbins, S. 2006. Managing organizational culture. In S. Goodall & F. Eden (Eds. ), Organisational theory: concepts and cases, 5th ed: p475. Frenchs Forest, NSW: Pearson Education Australia. [iv] BNP Paribas Employer Verified Reviews. http://www.indeed.com/cmp/Bnp-Paribas/reviews; accessed 4th Nov, 2014. [v] BNP Paribas Global Finance Division. BNP paribas group: Results as at 30 september 2014: http://www.bnpparibas.co.uk/en/2014/10/31/bnp-paribas-group-results-as-at-30-september-2014/; posted 31st Oct, 2014. [vi] Treanor, J., Rankin, J., & Moore, H. BNP paribas regrets misconduct that led to record $8.8bn fine: http://www.theguardian.com/business/2014/jul/01/bnp-paribas-misconduct-fine-sanctions; posted 1st Jul, 2014.